President Michael Roth ’78 addressed students at Wesleyan’s third biennial State of the School Address on Friday, Sept. 21. 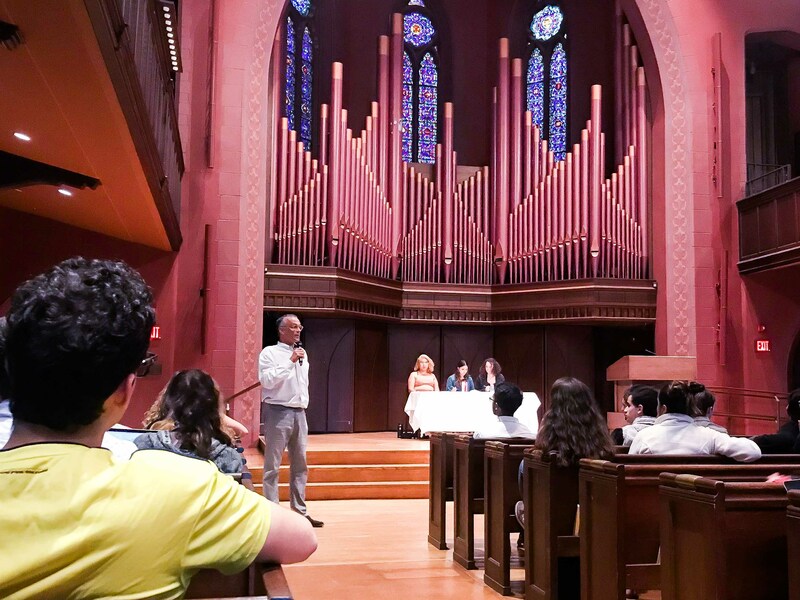 He gave an introductory speech detailing the three major divisions of the Wesleyan’s planning process, then answered questions submitted by students that were read aloud by Ankh representative Olivia Nájera-Garcia ’21, Argus Editor-in-Chief Camille De Beus ’19, and Wesleyan Student Assembly (WSA) President Emma Austin ’19. The moderators also asked follow-up questions. Roth began his introductory speech with an explanation of how the University approaches its planning. The three pillars of the approach are energizing the distinctive education that Wesleyan offers, increasing recognition of the University, and doing these first two items within a sustainable economic model. One of the ways in which the University is working to strengthen the education Wesleyan provides is decreasing the student-faculty ratio. The University also has facilities projects in the works that require additional fundraising. Austin began the Q&A portion of the event by asking a question regarding the recent CAPS departures, and a follow-up question that asked if the University was planning on hiring more CAPS therapists to reduce its ratio of 400 students for every therapist down to around 150:1—the ratio that Amherst and Williams boast. Roth replied by saying he was not sure why the therapists left, but Wesleyan has hired two replacements and is working on finding a third. “I don’t know if we’ll get to the point where Williams is, but our goal is to be able to provide students with services immediately and keep wait times down,” Roth said. De Beus then read a question asking if the University was aware that its sidewalks are noncompliant with both the American Disabilities Act of 1990 and the Rehabilitation Act of 1973, and asked what the University will do to make sure students with disabilities can have equal access to education. A standing committee, Roth explained, looks routinely at accessibility issues. New construction projects—including finishing the Basinger Center for Film Studies, renovating social science facilities, and replacing Hall-Atwater with a new building—will enhance accessibility in these particular facilities. Roth said Wesleyan students have representatives on the Board of Trustees that see the budgets as they’re drawn up, and if students had further questions they could ask him or anyone at the administration of financial services. Nájera-Garcia then read a question that expressed concern about the lack of financial aid for Winter and Summer Sessions and asked how the University plans to better support students during these times. Roth said this concern is a priority of Dean Mike Whaley, and Roth guessed that the University will look to providing meals for students in addition to housing, which is already provided. Returning back to the discussion about facilities, Nájera-Garcia asked if there were any construction projects that would support student residences, to which Roth replied that the University is trying to determine what the trade-offs of delaying academic facility construction to focus on residences are. Austin read another question asking if the University plans to expedite its initial plan of increasing the student minimum wage to $11 by 2021. In response to this, Austin read a question that compared the rate of Roth’s recent compensation increase to the rate of the minimum wage increase. De Beus shifted the topic of conversation to sustainability, reading a question that asked if Roth believed the University was adequately supporting sustainability initiatives on campus. Roth replied saying that the University could do more, and while it has seen a significant decrease in energy consumption and a moderate decrease in reducing waste, it has had the least success in integrating issues around success into the curriculum. As a follow-up question, De Beus asked why the University has chosen not to divest from fossil fuels but chose to ban bottled water on campus when divestment would have a greater impact on the environment than current sustainability measures. Staying on the topic of environmental issues, De Beus asked another follow-up question about what the University is doing to transition away from fracked gas as the primary source of Wesleyan’s power. The University, Roth replied, hasn’t found a suitable replacement for this type of energy, but it is still looking for substitutes. Nájera-Garcia then read a question asking about the University’s admissions policy, which is not need-blind. “Tuition costs have increased for the past few years, the endowment just recently hit $1 billion, and yet we are still not need-blind,” Nájera-Garcia said. “Do you expect that tuition will increase every year? When will Wesleyan feasibly be able to return to need-blind, why? In the same vein, Nájera-Garcia asked about how Roth justifies investing in the recent rebranding project. Nájera-Garcia then asked how the University plans to address a hostile environment for low-income students. Austin read a question asking about the new logo as a result of the University’s core messaging project. De Beus then read a question about student dissatisfaction with how the University plans to address the issue of severe lack of social spaces. Roth explained that while the University was asked by the city of Middletown to prevent overcrowding of parties, he wanted to take suggestions from students about how they wish to use social spaces. To follow up to Roth’s response, Nájera-Garcia asked if the trend of houses related to people of color being shut down earlier should be addressed. Roth replied that he was unaware of this issue and that he would address it immediately. Austin then changed the subject to ask the steps the University took since the Victim Rights Law Center (VRLC) audited the school in 2017. One suggestion the VRLC made was to implement restorative justice as an option in sexual assault cases, and Austin followed up by asking what the feasibility of implementing this system is. Nájera-Garcia then asked about accommodations for Muslim students. Roth responded that he was unaware that there was a request for Halal meal options and that the University was searching for a part-time Muslim chaplain. Austin then read a question regarding how the relationship between the student body and the administration has changed since Roth first became president and which issues have become less salient. Roth replied that many of the broader issues were similar, while more specific issues have become more and less salient. “I’m happy to be sometimes a target, sometimes an ally, sometimes an obstacle so that students can flex their political muscles and think about what they want and try to work together in groups to create a better community,” Roth said.